I’m Team Catfish founder, Jeff Williams. This all started when I kept finding myself hunting for the quality tackle for fishing tournaments like Bass Pro’s Big Cat Quest. I needed REAL CATFISH GEAR. For example; I wanted wide-gap, high-carbon circle hooks that were strong enough for big cats, but light enough for live-bait. The new Double Action Circle Hook is the result of my search. Check out my sinker-slides too, they make rigging easy. 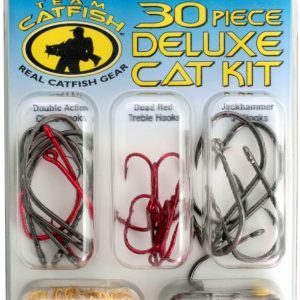 For more info, please visit my site at: www.teamcatfish.com.